Bet365 is the largest online bookmaker in the world, with currently more than 350 million visits per month. 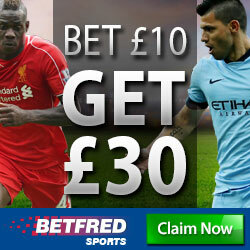 Bet365 offers a broad range of markets and features are very appealing to many players. The odds of Bet365 are certainly in the upper half of the market (see further below). 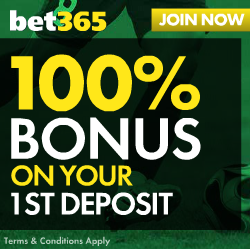 Although it is a privately owned company, you can be assured that Bet365 is a 100% reliable bookmaker. Bet365’s welcome offer for new customers is impressive, to say the least. They’ll match any deposit 100% up to £200. That means if you deposit at least £10 then you’ll get the same amount as bonus money to bet with on the sportsbook. Deposit £10 or more into your newly opened account. You will receive an email with a personal bonus code. Enter this code in the ‘My account, bonus section’, and you will get a matched amount in bonus funds. You can bet with your bonus as soon as you’ve bet your deposit amount. You won’t be able to withdraw the bonus, or bonus winnings until you have bets settled to the amount of 3 x (deposit + bonus). This is a very fair bonus term, and one of the lowest wagering requirements for a bookmaker welcome bonus we have found. The turnover requirement must be reached within 90 days of opening your account, which is a very fair term. Only bets with odds of at least 1/2 (1.50) or greater qualify towards the wagering requirements. You also need to use your code within seven days of making your deposit to claim the bonus. Bear in mind that you can only use your bonus funds until you have actually placed bets with the money you deposited in the first place. At Bet365, some countries are excluded from receiving the welcome bonus. Please read the general bonus terms to see if you qualify for the welcome bonus. This is a general overlook of Bet365 odds on the most important markets. We are pleased to see that the odds for the major UK football leagues are amongst the best of the market. Bet365 offers very attractive odds when you bet the day before the match or on the day of the game. These attractive odds are provided not only for the English Premier League but also for the English Championship, the English League 1 and the English League 2. LIVE betting is slightly above average: Bet365 odds on Live Betting generate a payout ratio of around 94% for all football markets. Please see our Bet365 Odds Analysis Page for full details on all markets. Champions League and Europe League odds are excellent when you bet the day before the match or on the day of the game. The major European competitions (German Bundesliga, Italian Serie A, Spanish La Liga, French Ligue 1) are around average, with payout ratios in the range of 94%-95%. For the 2nd tier European competitions (Turkish Superliga, Dutch Eredivisie, Belgian Eerste Klasse and the Portuguese Primera Liga), the odds have payout ratios of approximately 94%. LIVE betting is average: Bet365 odds on Live Betting generate a payout ratio of around 94% for all football markets. For Tennis, the odds are below market average. We recommend active tennis punters to look for other bookmakers. For Snooker and especially for Darts, Bet365 offers better odds than average. For Rugby Union, the odds provided by Bet365 are on the higher end. The chart below provides a summary of the payout ratios we have calculated for you. These are for 1×2 bets. 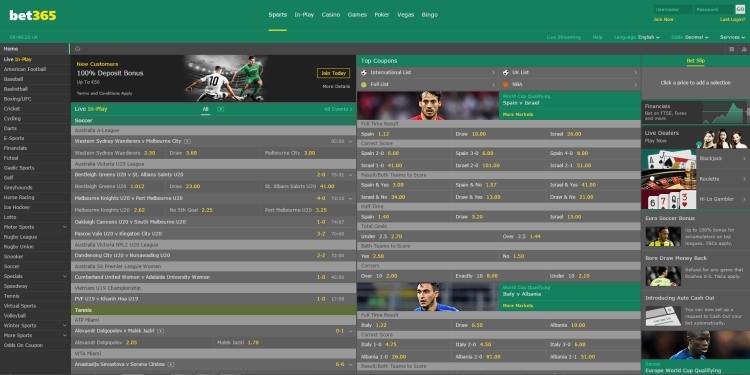 The payout ratios of other bets (such as Asian Handicap, Over/Under or Both Teams to Score) are provided on our Bet365 Odds Analysis Page. For Tennis (both men’s and women’s Tennis), the odds are clearly below market average. We recommend active tennis punters to look for other bookmakers. For Snooker but in particular for Darts, bet365 offers better odds than average. Is BET365 a Reliable Bookmaker? Bet365 has a superb reputation and is both customer friendly and reliable. Bet365 is a very prominent bookmaker and 100% reliable. Bet 365 is (by far) the largest online bookmaker. The welcome bonus of 100% up to £200 is very impressive, with fair bonus terms. The odds of Bet365 are on the higher end of the market and are especially attractive for UK football competitions, Champions League and the Europa League. We do not hesitate to recommend Bet365.